Back in July 2017, Chaffy was born as a Kickstarter campaign and WE BACKed it as we fell in love ever since we laid eyes on it. Having been fully funded Chaffy’s have been seen around the world and now fast forward to the present day. 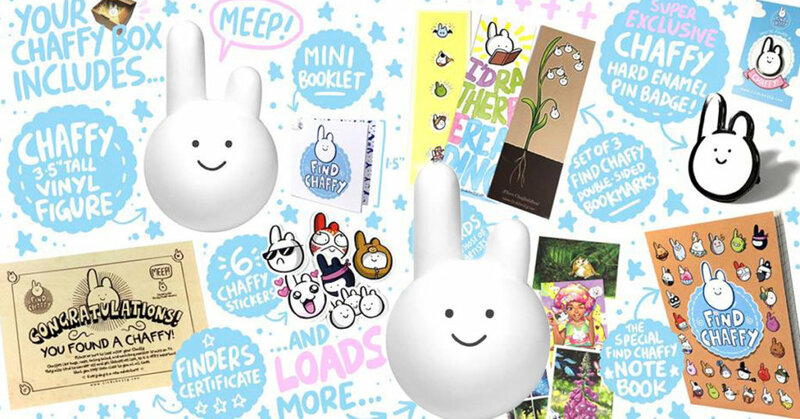 Jamie Smart the artist behind the loveable Chaffy, has announced for a limited time you can FIND ONE, in a box FILLED with Chaffy goodies! Yes, Jamie has released some online. Chaffies are small, round and cute creatures, with one and a half ears, who tend to get themselves lost all around the world. Fortunately, we here at Chaffy HQ have found loads of them and we’re shipping them out to loving homes, nestled inside a box filled with Chaffy goodies! – A set of 7 Chaffy art cards (A6 sized) by a variety of different artists. Find Jamie via http://www.fumboo.com/ ,Twitter and Facebook.